For some reason Yum! Brands shortened Kentucky Fried Chicken to simply KFC a few years back. In any case the food is quite unchanged and a lot of people, myself included, have a fondness for the standard Original Recipe. I found this list of seasonings to emulate KFC Original Recipe on the Yahoo Pressure Cooker Recipes group nearly two years ago. It’s by a guy named Edward Evans. I just recently got around to trying it. 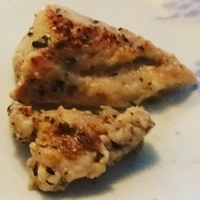 I browned a boneless chicken breast in my Cuisinart CPC 600 electric pressure cooker, being careful, as one must with a pressure cooker, to only use as much oil as the chicken would absorb. I removed the chicken from the cooker and inserted the trivet. I returned the chicken to the pressure cooker and added water to just below the level of the trivet, a little less than two cups. I had heated the water in the microwave while I was browning the chicken so my Cuisinart came up to pressure very quickly. I cooked on high for ten minutes and allowed ten minutes for natural pressure release before manually releasing the remaining pressure. I was quite pleased with the result. The chicken really did have a taste reminiscent of KFC.